You know that you are ready to venture into a career in beauty, but where do you start? To get a job, you need an education, which means you need to find an accredited, reputable school in your area. Today, you might notice that beauty schools are plentiful, but not all are created the same. When looking at schools and comparing their programs, there are a few items you want to consider to help you weed out the schools that are not a good fit for your career goals. Start by making a list of the beauty schools and programs located near you. Consider how far you want to drive when making that list. If you do not mind driving more than 30 minutes one-way, you can branch out further. Some areas may only have a few programs nearby, while others could have multiple schools in the same city. Now that you have a list of potential schools, the next thing is to narrow down that list based on your needs and tastes. You may be a person that is more concerned with tuition costs or the availability of financial aid; while others may want something more flexible with online courses available. Location: Consider the proximity of the school to your home or job. How long will you have to commute daily to class? What will that cost you in gas? Programs: Next, consider the programs available. You want a hearty mixture, in case you are unsure about which field of beauty you want to try. Some schools may focus on one program, while others offer an array of courses. 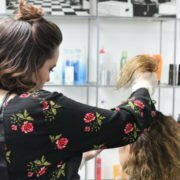 Teacher to Student Ratio: When learning something in the beauty sector, you need an instructor who has the time to teach you the intricate details and techniques. So, consider the teacher-to-student ratio of each program. Quality: The quality of the facility as well as the technology utilized by the instructors is also important. You want access to the latest beauty technology and training, including lasers. Financing: Most beauty school students cannot afford to pay cash for their tuition. Therefore, consider what financial options they have available. Does the school offer financial aid? Do they have in-house financing and payment plans to accommodate your budget? Cost: Compare the costs of tuition, books, and cosmetology kits. Some schools include the books and tools as part of the tuition fee, while others have you purchase these products separately. So, you want to calculate how much each program will cost in total. Class Schedule: Look at the schedule options for classes. If you already work full-time, do they have night or weekend classes that accommodate your job? Also, do they offer part-time in case you need to move at a slower pace? Job Placement: Schooling is critical, but so is the assistance with employment. Most reputable programs offer internships and job placement assistance so that you can start working upon graduation. Reputation: Assess the school’s reputation. You want a school that is well-known in the industry, one that comes highly recommended, and one that has successful student graduations. Atmosphere: Before you sign up, tour the school, meet administrators, and feel out the morale. Are students happy to show up to class? Do they seem pleased with their teachers? Looking for a Beauty School in Marietta, Ohio? Looking for a premier beauty academy in your local area? Preston’s Beauty Academy offers a variety of classes that are designed to suit every type of student. We also have an in-house salon, hands-on training, and laser rejuvenation so that you can further your education. Contact us today! Should You Go To Cosmetology School? Am I Too Old to Attend Beauty School?